Recently I went to Brooklyn in search of excellent bars, thrift stores and restaurants. Each place had a retro twist and something completely unique and magical about it. I spent most my time in Williamsburg and soaked in the artsy, creative vibes and the warm late May weather. I enjoyed seeing the thrift shops with their signage and chalk lettering, the restaurants serving up delicious, artisanal culinary delights and the bars that went from dressed up and classy to down and dirty. Being from and living in CT, I feel New York and all it's boroughs are my neighbors - neighbors I don't see often but know well. I was so wrong. It was fun though, to explore, to wander, to take in all the magic that Brooklyn has to offer. I wanted to write my guide of my favorite places + spaces in Brooklyn. Truth to be told, I know I barely scratched the surface and would urge anyone looking for retro fun in New York to check out Nicole Wilson and Krystle DeSantos' blogs! Maison Premier is a New Orlean's styled restaurant/bar known for it's oysters, Oysters, & small plates boasting serious culinary delights. Think New Orleans in the 1920's. Glamorous, lovely and ethereal. Maison is "inspired by hotel lobbies of days gone by, afternoons in Paris cafes, late night dinners brooding over bivalves and wading through glasses of pastis and absinthe.". I sipped on a blue moon (I'm really not one for cocktails but admired the colorful and unique concoctions of drinks the bartenders made. The whole vibe in Maison was vintage New Orleans. I felt alive and inspired in there! I tried oysters for the first time and I loved, loved the clams! The Clover Club was a great mix of vintage and modern. Live jazz music, classic cocktails along with some modern additions to the menu make Clover Club a great retro/modern meeting ground. The Clover Club also has some serious gorgeous vintage decor. Their parlor was absolutely stunning. I felt like I was walking into a bar from many eras past. I sipped on a drink called Apple Crisp. It was perfection! 10 Ft by Stella has amazing music playing and a serious array of retro threads. You can find something for $20 or $250, but regardless each vintage find has a piece of retro Brooklyn. A serious must go for vintage enthusiasts. Narnia has a cool, calming vibe when you walk in. The decor, the fashion, the lighting it's all perfect to set the stage for it's eclectic, boho vintage boutique. Some gorgeous maxi dresses here and lots and lots to swoon over! 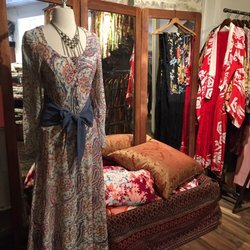 Amarcord is a swanky vintage boutique specializing in European apparel & accessories. There are some breathtaking pieces but needless to say, everything I like was out of my budget. It's a gorgeous store with some seriously chic, retro threads. I want to know - what are your favorite places + spaces in Brooklyn?